Second only to the Lake District's Helvellyn in popularity comes Haystacks - a rugged little promontary easily scaled, and popularised by Aflred Wainwright having had his ashes scattered on its rocky tops. With a more than ample scattering of tourists populating the summit of Haystacks, one could easily postpone this excellent walk for another day - but the acsent via Fleetwith Pike seems to deter the masses, and makes for a most excellent day out in the hills. The ascent of Haystacks is most popularly excecuted by starting at Gatesgarth Farm (NY194150). From here, an easy route up Warnscale bottom takes one "relatively" effortlessly to tops of Haystacks and the beautiful Inominate Tarn, Alfread Wainwrights final resting place. A brief scramble over the tops, and one can descend Haystacks via Buttermere Fell and return to Gatesgarth Farm in just a few hours. Whilst the above is undoutedy a fine walk, this extended walk takes in not only Haystacks, but the larger part of the beautiful Buttermere lake, and the exciting ascent of Fleetwith Pike - an undertaking far less intimidating than one might think and well worth the small amount of extra effort. Our walk starts at the small village of Buttermere itself, where the early birds may find some on-road parking - others will have to make use of the small National Trust car park at the Northern end of the village. Start out on the footpath through Wilkinsyke Farm (convenient toilet & icecream stop!) to pick up the permissive route along the Nothern side of Buttermere. From here 2km of easy walking by the wonderful lakeside will bring you, via a short on-road section, to Gatesgarth farm. At various points it is possble to descend a few feet to the waterside, where the early morning light can offer superb photographic opportunities. At Gatesgarth Farm three paths heads right. The first is to Peggy's bridge, the common return route for the popular Haystacks circular walk. The second brings you to Warnscale Bottom, a commendable ascent route. Just a few yard further up the Honister road, a third path heads right. This is our ascent route which, without futher to-do makes a direct ascent of Fleetwith Edge. The ridge is far less intimidating than it looks at first, rising in a series of steps, each more lofty than its predecessor. As you climb, take the time to look back - the views over Buttermere and Crummock water are perfect in every way. After 1km of relentless but rewarding climbing, you'll reach the summit cairn of Fleetwith Pike. From the summit of Fleetwith Pike (NY205142) the official footpath heads initially due East before turning South East towards Bell crags (NY218137), from which the main Honister Hause - Haystacks path can be picked up. If you're up for a little "off-piste" a series of sheep tracks, augmented by human footprints, will take you direct to the abandoned slate workings of Dubs Quarry, joining the Haystacks path at ~NY210136. From here, follow the track west for a short while before picking up the obvious foot path to Haystacks. Dubs Hut - at the disused Dubs Quarry. Passing the Warnscale bottom ascent route on your right, the clear path climbs to just-short of the summit of Haystacks, and the two summit tarns - first Blackbeck Tarn, then the smaller Inonimate Tarn. The path skirts around the western edge of the summit - a brief detour to the very summit (there is actually a series of craggy minor summits) will afford you the best views. Depending on your chosen route, descending from the final summit may require a small amount of easy scrambling. The path here has diverged, and it is easy to inadvertently head too far "in-land", only to find yourself back-tracking slightly to reach Scarth Gap (NY189 133) - the saddle between Haystacks and High crag / High Stile. 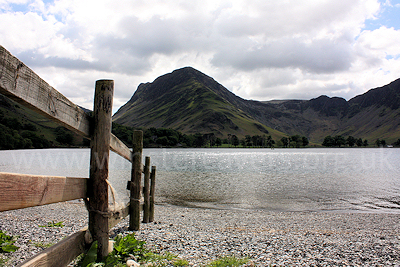 From here, you have two options for the return to Buttermere. At Scarth Gap the main track heads due North, dropping down in large steps to Peggy's Bridge and the Buttermere waterside. From here, do not cross the foot bridge, but instead keep left following the path along the side of Buttermere. A little short of 1km of level, open path will bring you to a fork, where you have the choice of following the permissive route (right) and keeping to the waterside, or forking left and climbing very slightly through Burtness wood. The routes converge at the far Western edge of Buttermere. If you're up for a more energetic return, from Scarth Gap you can climb up the path to the North West to gain the lesser summit of "Seat", and then via a small saddle climb again to reach the summits of High Crag, followed by High Stile (806m, NY167147). From here a route drops steeply down to Buttermere, but better is to stay high and traverse the broad ridge to Red Pike. A short distance past the summit of Red Pike a junction is reached. Right drops steeply via Bleaberry Tarn to the Westerm tip of Buttermere.